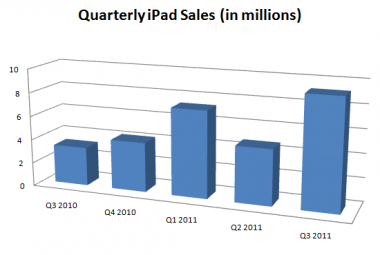 One doesn’t need to review each quarter of iPad sales to understand how dominant the Apple tablet has been. However, the numbers illustrate just how much sales have continued to grow. Sales have risen from three million or four million units per quarter in the first two quarters of iPad shipments to 9.25 million last quarter. That’s more than the company sold in last year’s holiday quarter and appears to be vastly more than any rival has sold in total. Even Android phone owners tend to buy iPads, rather than an Android tablet. This lends credence to the philosophy that there isn’t a large tablet market nearly so much as there is a large iPad market. While some expect (and may yet be right) that the iPad will lose share over time, just as the iPhone did to Android, others see the iPad as more akin to the iPod. It was a luxury item, as opposed to a phone, which is something of a necessity in the modern world. And when an item is a luxury, more people are likely to go for the luxury brand, if they decide they want the product at all. There are other parallels to the early days of the iPod. Remember that when Apple’s iPod came out it was not the first hard-drive-based music player. Indeed, there were devices like the Nomad Jukebox. However, Apple did have the early exclusive on Toshiba’s tiny 1.8-inch hard drive, the component that gave the iPod its significantly smaller shape. While Apple doesn’t have a stranglehold on any one component with the iPad, it does seem to have shored up enough supply, and at favorable enough prices, that competitors can’t really compete much on price. To match or slightly beat Apple’s price, it would seem hardware makers already have to forsake profit margins. Nonetheless, one recent study did show that Apple may be losing some of its total command of the tablet market. However, as Daring Fireball points out, those numbers reflect shipments into the channel. One of the key questions that will only be answered in the coming months is whether any of the competitive tablets can continue to sell well beyond their initial shipments needed to fill retail shelves and inventory. Plus, the field of Android tablets is growing ever more crowded, presumably putting pressure on prices as well as on device makers to continually upgrade their models. While Motorola had the first Honeycomb tablet with the Xoom, it has since been followed by ones from LG, Acer, Toshiba and Samsung, to name but a few. Meanwhile, Lenovo just announced two new models and Sony is offering up two Honeycomb tablets of its own later this year. And HP and Research In Motion are hoping to grab share with tablets based on their own operating systems. Then, of course, there is the question of apps. Apple has surpassed 100,000 programs that are optimized for its tablet. The number of apps for Android appears in the hundreds. Neither HP nor Research In Motion are anywhere close to the iPad when it comes to breadth and depth of tablet-specific apps. The biggest wild card could be Amazon. Unlike Apple’s other rivals, Amazon doesn’t have an announced tablet in the market. But also unlike the others, Amazon has some of the assets needed to compete, including its own music and video storefronts as well as its own app store, not to mention the Kindle book business. The company also has a track record of knowing how to use content to subsidize hardware, something no one in the industry has really been able to successfully do in their effort to take on Apple.